Intake Valve, 2.020'' x 4.907'' o.a.l. Exhaust Valve, 1.600'' x 4.907'' o.a.l. Head Torque w/Moly Lube 11mm ARP 70 Ft. Lbs. / 8mm 23 Ft. Lbs. Spring Pocket can be cut to 1.525, no deeper. For the ultimate high performance street LS1/LS2/LS6 aluminum cylinder head AFR's all new 210cc emissions legal (CARB EO #D250-4) heads are your only choice. Specifically designed for 1997 to present Gen-3 Chevy Corvettes, Camaros, and trucks using a 3.900'' cylinder bore. 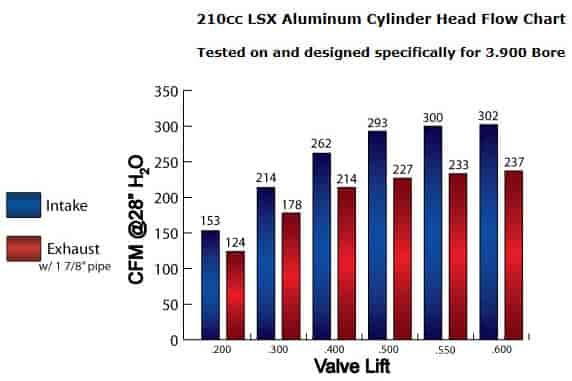 AFR's LSX cylinder head offers unmatched flow performance (302 CFM at .600'' lift) and features 2.020'' intake and 1.600'' exhaust valves with AFR's iron ductile interlocking valve seats. With only 210cc port volume (same as stock LS1 head) this is an incredible 70CFM increase over stock casting, creating unbelievable port velocity and performance. This 210cc cylinder head is ideal for normally aspirated 346-396ci engines. It features a 66cc combustion chambers and the LSX is a direct bolt on, no special parts required. Structural features like Air Flow Research's trademark 3/4'' thick head deck, a must for blown and nitrous applications, reinforced rocker stud bosses, and thick wall runners provide unparalleled durability. An exclusive new modern combustion chamber design with double quench pad area helps the LSX generate huge low- and mid-lift airflow numbers. If you need a snake charmer for that pesky neighborhood ''Cobra'' look no further. Made in USA. Installation Notes: LSX bead locks and aftermarket bead locks are not interchangeable. GM made their bead lock radius and depth different. AFR locks are the same as GM LSX. Hydraulic roller cams in ''LS'' Gen III engines typcially experience valve float at 6600-6800 RPM's. If you are using aftermarket rocker arms, plan on running over .600'' gross valve lift, or if you are revving beyond 6600 RPM valve float will become prominent. AFR suggests you upgrade your springs to AFR p/n 033-8019. This upgrade spring has higher seat and open pressures (155/410+) to better reduce the risk of valve float in more aggressive applications.